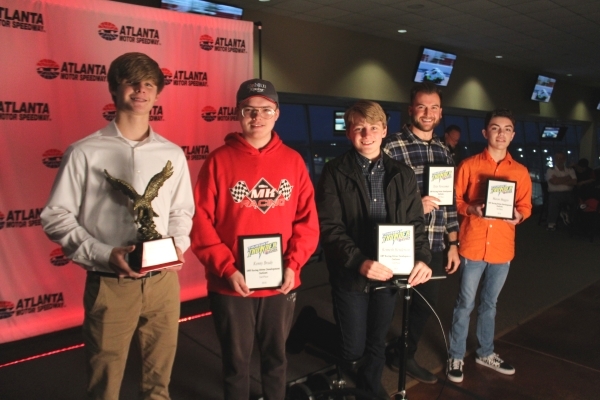 A year’s worth of accomplishments by racers in Atlanta Motor Speedway’s Legends and Bandoleros series were recognized at the Speedway’s annual year-end banquet Saturday. In addition to the series champions, several other drivers received special awards noting other achievements both on and off the track. Each year these awards recognize drivers that went above and beyond just driving a racecar. • President’s Award: Bill Plemons Jr. Drivers who earned awards bearing the name of Thursday Thunder alumni David Ragan, Joey Logano, and Reed Sorenson also received a personal letter from that driver congratulating them for their success. While Mother Nature didn’t put a damper on the banquet’s festivities inside the Speedway’s Club One, she did wash out a planned double-header of racing action for Saturday. Due to Saturday’s cancellations, the next scheduled Legends event at AMS on January 12, 2019, will be a double-feature on the infield road course. More information can be found at www.atlantamotorspeedway.com or www.legendsofga.com.